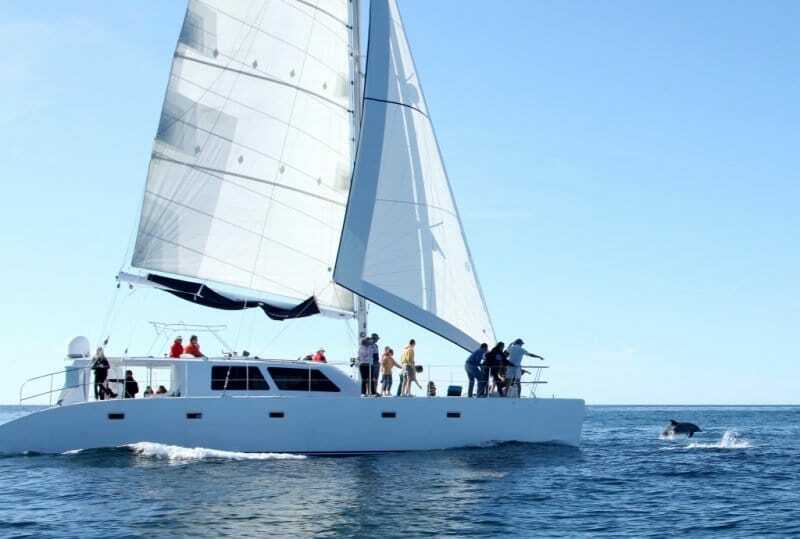 Our catamaran yacht is a gorgeous 60′ sailing catamaran available exclusively for private charter. 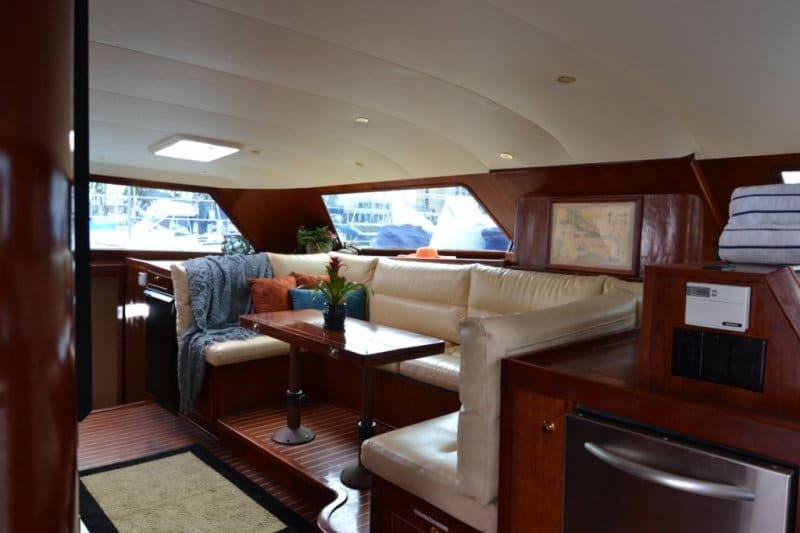 Her beautiful teak interior and spacious outdoor decks are sure to impress. At 60′ in length and 32′ in the beam (wide), this yacht has more deck space than most 100′ yachts. Her wide beam also makes her very stable and comfortable while at sea. 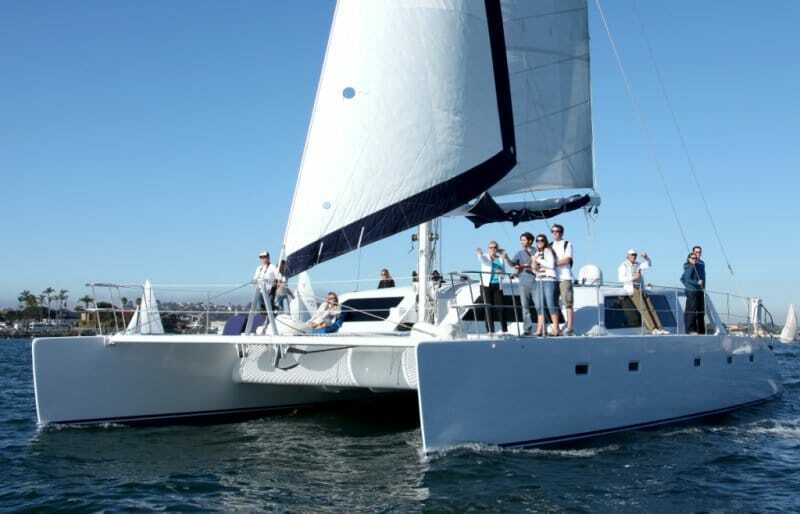 This is an ideal yacht for entertaining either dockside or under sail. 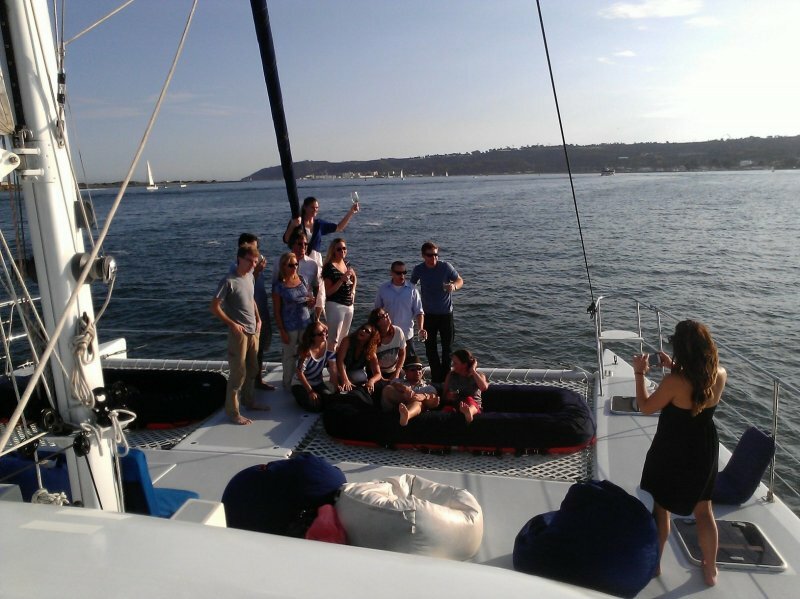 On this catamaran, we pride ourselves on providing first class service. Our professional and very experienced Captain and crew will help to ensure an incredible and memorable experience for you and your guests. 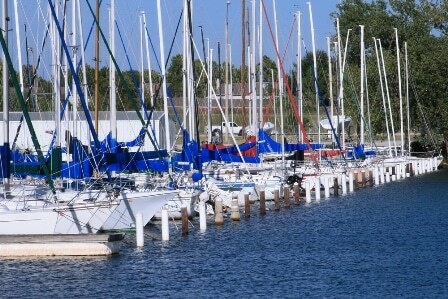 In addition to nearly 2,000 square feet of sail area, our yacht also has twin 200HP turbo engines. So, whether under sail or under power, we are faster than most power yachts of the same size. 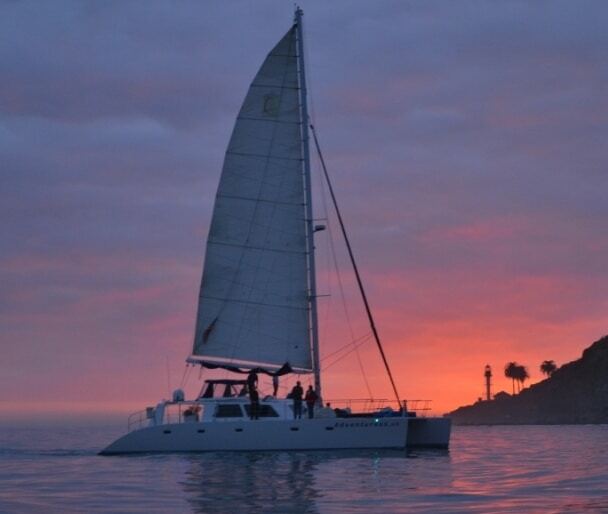 She is conveniently docked at Harbor Island, across from the San Diego airport. 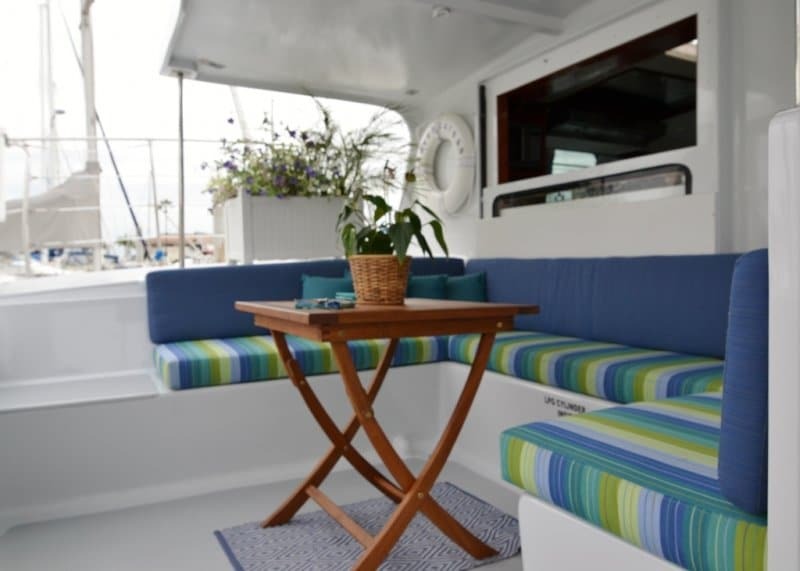 With advance reservations, she can be delivered to nearly any waterfront location to rendezvous with your party. 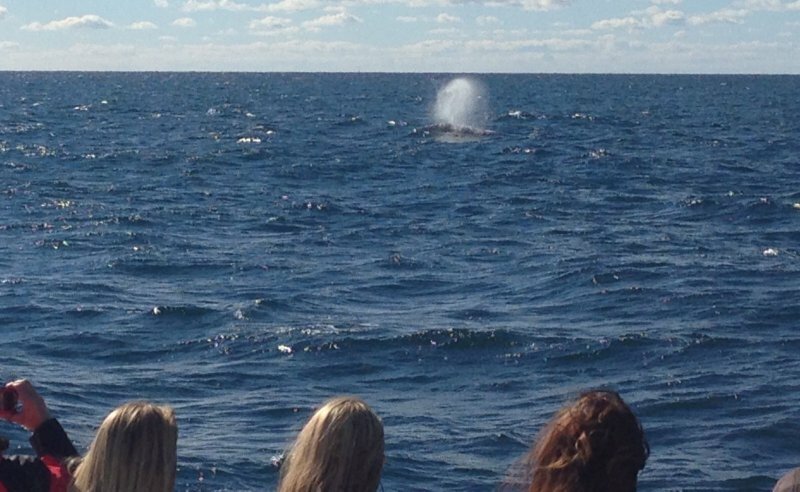 All meeting details for your charter are emailed directly to you after booking. $1199.00 per hour.2 hour minimum. 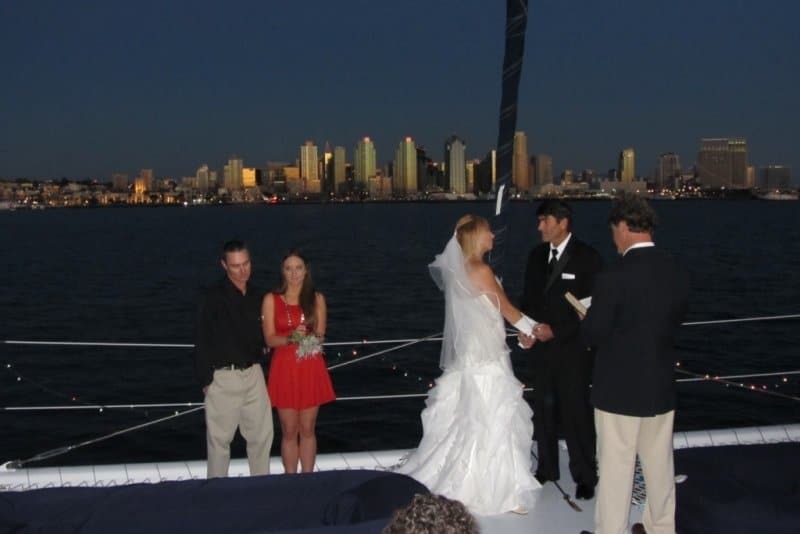 San Diego – Harbor Island. 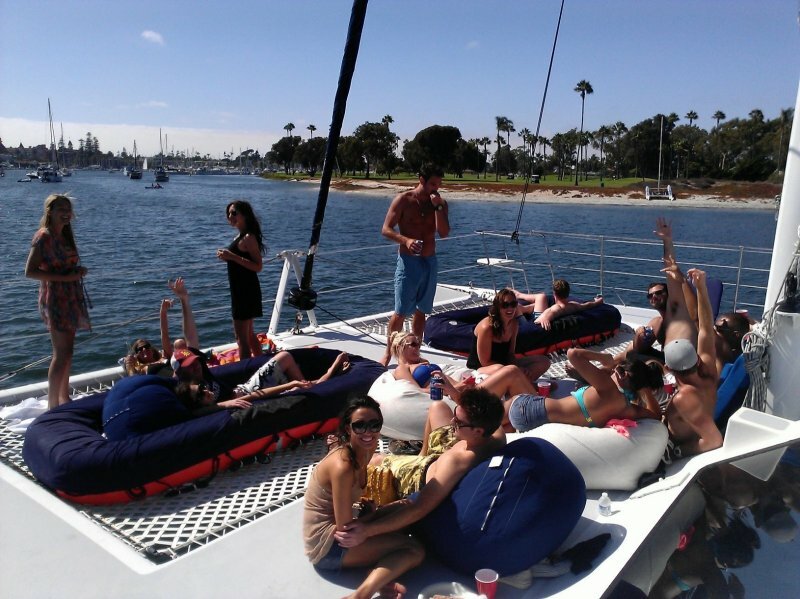 Up to 49 Guests can be included in your private charter. (Any group size can be accommodated. Please call us for a custom quote). Upon request. Based upon availability. What you would wear to the beach! You might get a little splashed but not wet unless you want to. Oven, 6 burner stovetop, and a Microwave. NO CANCELLATIONS OR REFUNDS WITHIN 7 DAYS OF YOUR CHARTER DATE. The main salon is decorated with beautiful teak wood and the large panoramic windows allow you to enjoy the incredible scenery without having to go outside. The dining table is surrounded by comfortable leather bench seats, and a flat screen TV with DVR is adjacent to the dining table for easy viewing. (If needed, the flat screen TV has a USB port hookup for power point/electronic presentations.) The interior is warm and inviting, with plenty of counter space for buffet style catering. A private on board chef can also be arranged. Our chef will work directly with you to design a custom menu. The main salon also boasts a bar and a 52 bottle wine cooler, which can be stocked with your favorite vintage(s). Sommelier and mixology services can also be provided upon request. 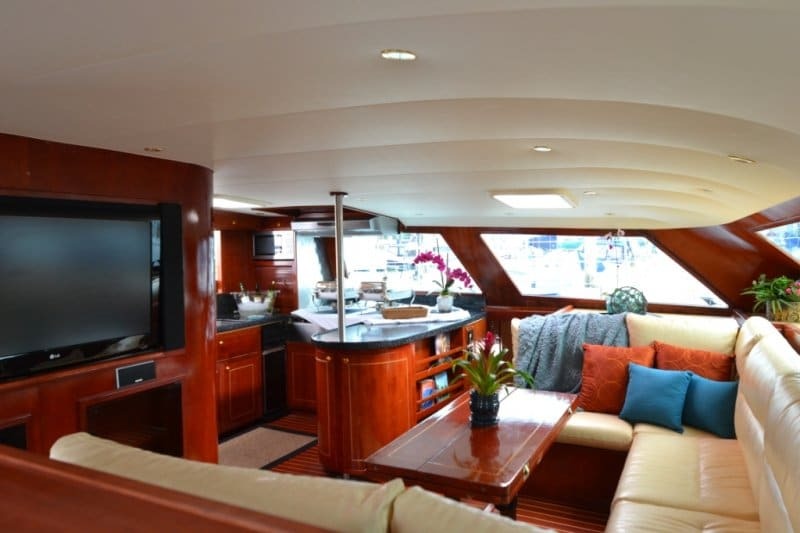 The spacious top decks can easily accommodate fifty guests without seeming crowded. The forward deck and trampolines are the perfect place to soak up the famous Southern Californian sun while enjoying the sweeping views. The deck chairs and oversized bean bags are ideal for sinking into and relaxing. In the evening, the underwater lights provide for a unique added ambiance. The spacious and covered aft cockpit has comfortable bench seating. This intimate area is a great indoor/outdoor space where you can enjoy being outside while protected from the sun and elements. 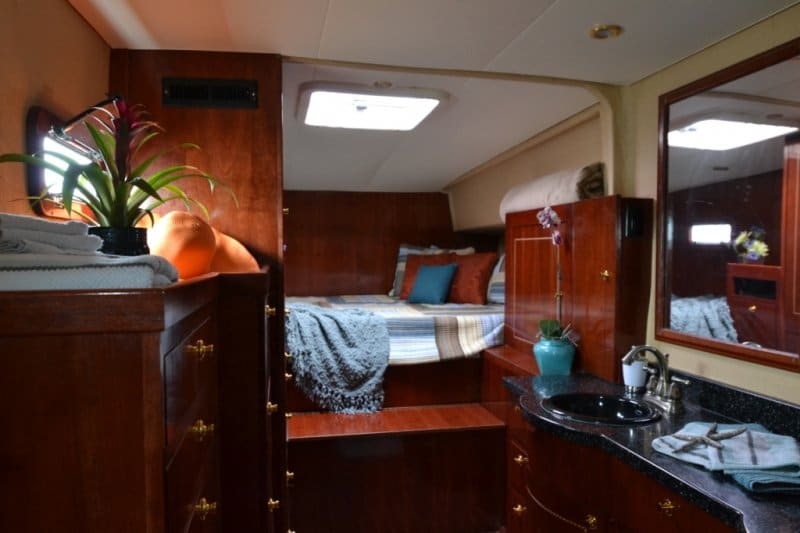 If you are looking to add a little adventure to your sailing excursion, the walk-up transom and large swim deck allow for easy access to the water for a refreshing swim. Stand-up paddle boards, kayaks and/or snorkeling equipment can also be provided. For more high speed fun, we can arrange for jet skis or RIB boat(s) to be delivered to the yacht. There are outdoor hot water showers on the bow and stern decks, so you can rinse off after playing on the water. Inside each stateroom are private showers for your use at the end of the day.